A blessed and joyful Christmas to you all! May the love of God overflow in you and all those you love, this festive season, as you share in celebrating the greatest Christmas present of all, God’s gift of himself, Emmanuel – God with us, always and everywhere, no matter what we face in life. Whether the story is true, I have no idea. But I do know that sometimes we concentrate on Christ’s infancy, and fail to grasp that Christmas is at least as much about his deity – the eternal Word taking flesh, to be the Saviour of the world. His complete vulnerability and weakness as a tiny baby points to the vulnerability and weakness he will embrace as he allows himself to be crucified for the sins of the world, to bring healing and redemption wherever there is brokenness and destruction, and to overcome death so we might have life in abundance, in this world, and in all eternity. St. John the Evangelist, in the famous words that begin his gospel, speaks of Christ being to us a light in our darkness, a light that no darkness can put out. These words of course resonate more strongly at Christmas time in the northern part of the diocese, but even in the height of our southern summer in San Antonio, I find them powerfully speaking of the promise of true hope, no matter how bleak our circumstances. Through Christ’s redemptive power, a means for us to find healing is manifested, and to be made his conduits for reconciliation and peace-building. As Christmas draws near, it seems to me that in bringing, as we must, our stories, our memories, our pain, our stress, our wounded ness, to Jesus, we are almost offering them as the Wise Men offered their gifts, the marks of their own lives, kneeling before the infant king – so that he can transform them for his own, life-giving, purposes. The Wise Men came to the manger because they had spent long years learning how to interpret the heavens, and so recognized the importance of the star when it appeared. Reading the signs of the times is the task of all Christian leaders, so that we can bring to bear the truths of the gospel, with all its promises of life and liberty, wherever we find war, death, oppression and their lasting effects at work. This is God’s promise for the Diocese of Mid-America, and for all his children throughout the Anglican Province of America, our intercommunion partners, and all the faithful Christians of the world. And so we must not be afraid to speak truth to power, and be responsive to the needs of God’s people, whom we are called to serve through joining in God’s mission. We aspire to be like the prophet Isaiah, responding to God’s call by saying ‘Here am I, send me!’ (Isaiah 6:8) Yet, the words of St. Paul in Romans 12, remind us that this response finds its place within a far wider missional context of presenting ourselves as ‘living sacrifices’. (This is, of course, an essential part of the incarnation – culminating in Christ’s sacrificial death upon the cross.) St. Paul goes on to remind us that we must not ‘think too highly of ourselves’, but rather find our place within the body of Christ, the Church, called to serve one another with whatever gifts we are privileged to receive; and together to serve the world around us. ‘Peace be with you! As the Father sends me, so I send you’ said the risen Christ to his disciples (John 20:19-23) – and this is still his message and his call to all who would follow him. So then, dear brothers and sisters in Christ, may you all have a wonderful celebration of Christmas – worshipping the Christ-child, but also growing in your own knowledge and love of God so you may not be mere ‘children, tossed to and fro and blown about’ by every difficulty and temptation that comes your way, but rather may come ‘to maturity, to the measure of the full stature of Christ.’ (Ephesians 4:13,14). To him be glory in his church, now at Christmas, and always. O LORD Jesus Christ, who at thy first coming didst send thy messenger to prepare thy way before thee; Grant that the ministers and stewards of thy mysteries may likewise so prepare and make ready thy way, by turning the hearts of the disobedient to the wisdom of the just, that at thy second coming to judge the world we may be found an acceptable people in thy sight, who livest and reignest with the Father and the Holy Spirit ever, one God, world without end. Amen. After reading the Collect for the Third Sunday in Advent, say the one below for the Advent Season. Scriptural readings for the third week of Advent. As Advent progresses, the Church turns us more from preparation for the birth of Christ at Christmas, to preparing ourselves for His Second Coming. Today, the prophet Isaiah describes what the world will be like after the Second Coming of Christ. This will be the New Jerusalem, with no more war, violence or gloom. There will be rejoicing, understandings, and justice in the world. The earth will be renewed, and all nations will glorify the God of Israel. As we begin the third week of Advent, we see that the Lord has passed His judgment on Israel, whose obedience to His Word is, at best, merely out of habit. Many of the children of Israel no longer even acknowledge Him as Lord. Religion had become routine instead of real. We often slip into routine patterns when we worship, and we do not give God our love and devotion. If we are to be called God’s people, we must be obedient, and honestly and sincerely worship Him. The gospel will be preached to all nations by Christ – including the Gentiles. The Second Coming will bring both destruction and joy. The powers of men will be destroyed. Our fate will be decided by our own actions. We must prepare for both Christ’s Second Coming as well as His Birth at Christmas. We cannot adore the Child in the manger in Bethlehem without also bending our knee before the just Judge, Who suffered and died for our sins. The Child in His Mother’s arms is the Man upon the Cross, and the King Who will return at the end of time. That is the message of Advent. In 2018 go to the readings for December 17 through Christmas beginning on Monday, December 17. [See below these readings in the Fourth week of Advent] Of course, one might want to read both sets of lessons in this last week of preparation. In this reading for the third Wednesday of Advent, we see that Judah trusted other nations and people for help, instead of trusting God. They were hungry for a strong king who would rule with justice. That “righteous King” will be Christ. One day, God’s Son, a King unlike any other king, will reign in righteousness and justice. “Then everyone who has eyes will be able to see the truth, and everyone who has ears will be able to hear it. (Is. 32:3)” At the Second Coming, Christ will establish perfect justice. Those who are evil and deceitful will no longer get their way. In the world to come, the just man can live free from the distractions of sin. In this reading for Thursday of the third week of Advent, the Prophet Isaiah once again describes the coming of the Lord. God acts to change the condition of the people here on Earth. Only when God is among us can we truly achieve peace and fruitfulness. “The Lord will greatly bless His people. . . . bountiful crops will spring up . . . their cattle and donkeys will graze freely” (Is. 32:20). These are the words of the righteous remnant who were waiting for God to deliver them from their oppression. “Though the LORD is very great and lives in Heaven, He will make Jerusalem His home of justice and righteousness, In that day he will be your sure foundation, providing a rich store of salvation, wisdom, and knowledge. The fear of the LORD will be your treasure” (Is. 33:5-6). We believe that Christ comes twice: first at Christmas; and second, at the end of time. These prophesies of the reign of the Lord began to be fulfilled when Christ was born and brought new life into the world, and they will be completed at His Second Coming. As the third week of Advent draws to a close, the prophecy of Isaiah shifts more completely to the coming of the Lord at the end of time. In this reading for the third Friday of Advent, the earth will be cleansed with fire, and only the just man will emerge. These sinners realize that they could not live in the presence of a holy God, because He is like an all-consuming fire that devours evil. Only those who are honest and fair and speak truth can live with God, and He will supply all our needs, because the LORD will forgive their sins. He will live in the eternal Jerusalem, ruled by Christ. Isaiah has delivered a message of judgment on all nations, including Israel and Judah, for rejecting God. Now Isaiah breaks through with a vision of beauty and encouragement. God is just as thorough in His Mercy as He is severe in His judgment. This same moral perfection of God is revealed in His love for all He has created. This chapter is a beautiful picture of the final Kingdom in which God will establish His justice and destroy all evil. This is the world the redeemed can anticipate after God’s final judgment, when all creation will rejoice in God. God is preparing a way for His people, who walk in His ways, to travel to His home, and He will walk beside us as we go. “They will enter Jerusalem singing, crowned with everlasting joy. Sorrow and mourning will disappear, and they will be filled with joy and gladness” (Is. 35:10). After reading the Collect for the Fourth Sunday in Advent, say the one below for the Advent Season. Scriptural readings for the fourth week of Advent. The Book of Isaiah makes a dramatic shift at this point. It tells of the majesty of God, who is going to rule the earth and judge all people. God will reunite Israel and Judah, restoring them to glory. Isaiah gives them comfort and tells of the restoration of Israel after the exile. Judah still has 100 years of trouble before Jerusalem will fall, and then 70 more years of exile. God tells Isaiah to speak tenderly and comfort them. The voice of someone crying in the wilderness to make the highways straight, level the mountains and valley, straighten out the curves and smooth out the rough places, then the Glory of God will be revealed. God’s people are compared to grass and flowers that wither away. We are mortal, but God’s Eternal Word is unfailing. “The grass withers and the flowers fade beneath the breath of the LORD, . . . but the Word of God stands forever” (Is.40:7-8). God will “feed His flock like a shepherd. He will carry the lambs in His arms, holding them close to His heart. He will gently lead the mother sheep with their young” (Is. 40:11). Since the third Saturday of Advent always falls on or after December 17, use the scripture reading for the appropriate day (listed below) instead. During the last eight days before Christmas (December 17-24), the prescribed readings include the greatest prophecies from the Book of Isaiah. Today, we read of a Christ-figure: Cyrus the Great, king of the Persians, whom God used as a protector of the Jews, even though Cyrus did not profess faith in Him. This is the only place in the Bible where a Gentile ruler is said to be “anointed.” God is the power over all rulers, and He anoints whom He chooses for His special tasks. Cyrus’ kingdom spread across 2,000 miles – the largest of any empire known at the time – including the territories of both the Assyrian and Babylonian empires. God anointed Cyrus because God had a special task for him to do for Israel. Cyrus would allow God’s city, Jerusalem, to be rebuilt, and he would set the exiles free without expecting anything in return. Few kings of Israel or Judah had done as much as Cyrus did for God’s people. God spoke through Isaiah to saying, “I will raise up Cyrus to fulfil my righteous purpose, and I will guide his actions” (Is. 45:13). The works ascribed to Cyrus are those that are later performed by Christ. Scripture Reading for December 18th - Isaiah 46:1-13 ~ The Lord’s Plan of Salvation is Eternal. Cyrus-the-Great would carry out God’s judgment against Babylon. The Israelites were constantly tempted to abandon faith in God and to turn to idols instead. In this passage from the Book of Isaiah, the Lord reveals the futility of idols. God created us and care for us. He alone is our God; and He alone can save us. His love is so enduring that He will care for us throughout our lifetime and even through death. Much of the Book of Isaiah speaks of a future deliverance when we all will live with God in perfect peace. God offers this future hope and help for our present needs. His righteousness is near us, and we do not have to wait for His salvation. His plan of salvation will soon begin, with the birth of His Son, Jesus Christ. The prophecies of Isaiah continue to point to the coming of Christ. Today, we read of the fate of Babylon, which represents those who have rejected the Lord. Here Isaiah predicts the fall of Babylon more than 150 years before it happened. At the time of Isaiah, Babylon had not emerged as the mightiest force on earth – the empire that would destroy Jerusalem and Judah. God used Babylon to punish His sinful people - the Israelites (the Babylonian captivity), but the Babylonians never came to worship Him. Babylon will be punished for her unbelief. God then used the Persians to destroy Babylon and free His people. Nebuchadnezzar exalted himself as a “god.” The God of Israel taught him a powerful lesson by taking everything away from him (Daniel 4:28-37). Now, as Christ comes, Israel is restored in the New Testament Church. The people of Judah felt confident because they lived in Jerusalem, the city with God’s Temple. They depended on their heritage, their city, and their Temple – but this was a false security because they did not depend on God. There was nothing in the actions, attitudes, or accomplishments of the people that would compel God to love or save them. For God’s own sake, and to show Israel who He is and what He can do, God saved them. We are not saved because we are good, but because God loves us, and because of His forgiving nature. In this passage from the Book of Isaiah, the Lord tells the people of Israel that His prophecies, announced in the past and already fulfilled, were to keep Israel from falling into the worship of idols. Now, the Lord will announce new prophecies—those concerning Christ—and the fact that they have not been heard before will be evidence of the power of God, once they are fulfilled. As Christmas approaches, the passages from the Book of Isaiah might seem more familiar. We might question why the Lord would choose Cyrus as His “ally.” How could the Lord choose a pagan king, an enemy? It was Cyrus whom God would use to free His people from their captivity in Babylon. The mission for Cyrus was to set Israel free by conquering Babylon, then to decree that all Jews could return to their homeland. Who but a prophet of God could predict such an inconceivable but true story about 200 years before it happened? When the captives were leaving Babylon many years after their captivity, they were shouting with joy, just as their ancestors did as they crossed the Red Sea with Moses, knowing that they were at last free from slavery. Today's reading includes verses that we have all heard in Handel's Messiah. The Lord identifies Himself as the Creator of all, and He describes Himself in ways that Christ will be described. Before the “Suffering Servant” - the Messiah - was born, God had chosen Him to bring the light of the gospel (the message of salvation) to the world. This is the Lord Who led His people out of Egypt and into the Promised Land. Now, He promises to lead us out of the darkness of sin and into the light of the New Covenant. Christmas is coming, and so Isaiah's prophecies are turning toward the restoration of Israel. The people of Israel felt that God had forgotten them in Babylon. Isaiah pointed out that God would never forsake them, just as a loving mother would not forget her little child. “See, I have written your name on the palms of my hands” (Is. 49:16). God would prove to the world that He is God by doing the impossible – causing warriors to set their captives free; and those warriors would even return the plunder they had taken from the captives (Is. 49:24-24). God had done this before at the Exodus, and He would do it again when the exiles returned to Israel. God keeps His promises – His Covenant – even when we do not uphold our end of the agreement. Christ, through the plan of salvation, will reunite all mankind to God. Our sins have separated us from Him, but the Lord does not forget those whom He has both created and chosen. In today's reading, the Prophet Isaiah assures us that what the Lord has promised, He will deliver. Isaiah reminds the faithful remnant to remember their spiritual heritage – their ancestors Abraham and Sarah. Even though Abraham was one person, much came from his faithfulness. Isaiah gave the people of Israel hope when they faced scorn and insults. God had performed many miracles in founding Israel – perhaps none so exciting as making a dry path through the middle of the Red Sea. Our God is this same God. His methods might change, but His love and care for us does not. If these few – Abraham’s descendants - could remain faithful, even more could come from them. God chose Abraham for his justice, and from him, He raised a great nation. From that nation, a Child is born, and He will bring salvation to all mankind. The long wait is almost over; our redemption is at hand. God says that the feet of those who bring good news are “beautiful” (Is. 52:7). The exiles could return safely to Jerusalem because of Cyrus’ decree and guaranteed protection. The Lord would go before them and point the way and be behind them for protection – just as He had done in the first Exodus from Egypt. The “servant” is the Messiah, our Lord Jesus Christ. Jesus is the “Suffering Servant” who will be highly exalted because of His sacrifice for us on the Cross. Tomorrow, Christ becomes a Man, but not just any man; He is the God-Made-Man, He is God Incarnate – in the flesh - Who cleanses us from our sins. Israel is restored, in the Church of the New Testament; and the Gospel is preached to all nations. The Nativity of our Lord, or the Birthday of Christ, commonly called Christmas Day. O GOD, who makest us glad with the yearly remembrance of the birth of thine only Son Jesus Christ; Grant that as we joyfully receive him for our Redeemer, so we may with sure confidence behold him when he shall come to be our Judge, who liveth and reigneth with thee and the Holy Ghost, one God, world without end. Amen. This Collect is to be said daily throughout the Octave. The Messiah has come down and become one of us, for our Salvation. The Second Sunday in Advent ~ The Collect. After reading the Collect for the Second Sunday in Advent, say the one below for the Advent Season. Scriptural readings for the second week of Advent. The readings from the first week of Advent are a call to Repentance – to stop doing what is evil and to begin to do good. The readings for this week remind us that we must submit ourselves in humility to God’s will, as we prepare for His coming again. As we enter the second week of Advent, we continue reading from the book of the Prophet Isaiah. In today's selection, the Lord calls on the inhabitants of Jerusalem —those who have been saved — to mourn for their past sins, yet they continue to celebrate. They aren't thankful to God for saving them, and thus the Lord vows to humble them. Isaiah’s prophecies move from the first coming of Christ to His second coming. As we draw nearer to Christmas, our thoughts should rise from the manger in Bethlehem to the Son of man descending in Glory. We must remember that one day when we least expect it, Christ will return, as the Apostles’ and Nicene Creeds says, “to judge both the quick (the living) and the dead.” Let us prepare for both the coming of Christ as the infant in the manger, and at the end of time. True repentance means conforming ourselves to the way of the Lord. In this reading for the second Monday of Advent from the Prophet Isaiah, we see the Lord overturning all of human society, because of the sins and transgressions of the people. We see that not only the people suffered from their sins, but even the land suffers the effects of evil and breaking God’s Law. “Destruction falls like rain from the Heavens; the foundations of the earth shake.” (Is. 24:18). God’s ways are not our ways. To be pleasing in the eyes of the Lord, we must humble ourselves. Isaiah prophesied not only about the coming of Christ as a child in Bethlehem, but about the final reign of Christ as King over all the earth. In this selection for the second Tuesday of Advent, Isaiah tells us of the final judgment. The earth has broken up and collapsed because of violent shaking. On the final day, the LORD will punish those spiritual forces who oppose Him. Nobody will escape God’s judgment. Isaiah 25:4 tells us that God is a tower of refuge to the poor and oppressed and those in need. We are reminded of the “Beatitudes” when Jesus tells us that God will bless the poor and they will enter the Kingdom of God. Yesterday, we read of the final judgment of God on the actions of men. Today, we hear the promise of Christ's reign over all the nations. Here is a marvelous prophecy of “all the people of the world” – Gentiles and Jews together – at God’s Messianic Feast, where there is celebration of the overthrow of evil, and the Joy of Eternal Life with God. This shows God’s intention that His message was for the whole world, and not just for the Jews. During this feast, God will end death forever (Is. 25:7-8). Those who participate in this banquet feast will be those who have been living by the faith that God commanded us to live. That is why they say, “This is our God! We trusted Him, and He saved us!” (Is 25:9). The earth will be remade; death shall be destroyed; and men shall live in peace. The humble and the poor will be exalted, but the haughty will be humbled. Earlier in this week, Isaiah has shown us the judgment of the Lord, and the establishment of His reign on earth. At times, the path of the “righteous” does not seem smooth or easy. We are never alone because God is there to help us, to comfort us, and to lead us, and He gives us wisdom to make decisions, and faith to trust him. When God comes to judge the earth, the guilty will find no place to hide. Jesus said the hidden will be made known because His truth, like a light shining in the dark, will reveal it (Matt. 10:26) The just man does not fear the justice of the Lord or complain about his own punishment, but looks forward to the resurrection from the dead. Isaiah prophesied that the Lord would destroy the vineyard—the house of Israel—because His Chosen People had abandoned Him. In “that day” the Lord will punish Leviathan, the enemy of God’s created order. Although evil is a powerful enemy, God will crush it and abolish it from the earth forever. God will restore His trampled vineyard, protect and care for it. His people are no longer worthless fruit. Thet will produce good fruit for the whole world. Isaiah compares the state of Israel’s broken spiritual life with the dead branches of a tree that are broken off and used for firewood (Is. 27:11). Trees often represent spiritual life in Scripture. The trunk is the channel of strength from God; the branches are the people who serve God. Tree branches waver and blow in the wind, and like Israel, they dry up from internal rottenness and become useless for anything except building a fire. In this reading, however, the Lord restores the vineyard and gathers those who are just to worship Him in Jerusalem, the symbol of Heaven. The "children of Israel" are now all the faithful. As the second week of Advent draws to a close, Isaiah once again prophesies the Lord's judgment upon Jerusalem. God will bring disaster upon “Ariel” the city of Jerusalem, and there will be weeping and sorrow. Jerusalem will become what her name means – an altar covered with blood. God will have Jerusalem’s enemies surround the city and attacking its walls. His judgment will be swift and overwhelming, like a horde of nations descending in war. But God, “the LORD of Heaven’s Armies, will act for Jerusalem with thunder and earthquake and great noise, with whirlwind and storm and consuming fire. All the nations fighting against Jerusalem will vanish like a dream!” (Is. 29:6-7). The First Sunday in Advent ~ The Collect. An excellent way to focus our thoughts and deepen our understanding of the meaning of Advent is to turn to the Bible. Sometimes, however, it’s hard to know where to start. That is why the Church has provided us with the Lectionary Readings, Scripture passages that are appropriate to every day of the year. In our Book of Common Prayer, the readings for the Advent season are on pages x and xi. One may follow these readings or the abbreviated ones to follow. Every season of the Church year has a certain theme or themes. During Advent, the Church turns primarily to the Old Testament Book of the Prophet Isaiah, as well as Malachi, Jeremiah, Zechariah, Baruch, Amos, Nahum, Haggai, and Zephaniah. Scriptural readings for the first week of Advent. During Advent, we should try to slow down our lives, and quietly spend a few minutes each day – reading the following scriptures. There are many themes in Isaiah’s prophecy, but some of the most important are: the need for repentance, conversion of our spirit, and the extension of God’s salvation from Israel to all nations. As we listen to Isaiah call Israel to conversion, we should think those things we need to remove from our own lives this Advent, as we prepare ourselves for the coming of Christ. On the First Sunday of Advent, we read the beginning of the Book of the Prophet Isaiah, and of the Sins of Rebellious Israel and Judah. The people were sinning and had turned against God. They had broken their moral and spiritual Covenant with God, and thus were bringing God’s punishment upon themselves. We will hear the prophet speak in the voice of God. He will call the people of Israel in the north and Judah in the south to repentance, and to prepare them for the coming of His Son. As Christians, we must remember that the people of the Old Testament – the Old Covenant – also represent the New Testament Church, so Isaiah’s call to repentance applies to us as well. Christ came to mankind at that first Christmas; but He is going to come again at “the Last Day” -the end of time, so we must prepare our souls. Isaiah admonishes his people to give up their evil ways, learn to do good, seek Justice, help the oppressed, defend the widows and orphans, or the Lord God will let them be devoured by the sword of their enemies – the Assyrians. In this reading, Isaiah continues to call Israel to account. Jerusalem represents all of Judah, and God compares his people to a prostitute. They had turned from God and were worshiping idols, and they were in spiritual adultery. God reveals His plan to remake Israel. He will purify her as metal is purged in a smelting pot, and He will remove all their impurities. He will make them the shining city on a hill, toward which people of all nations will turn for Peace. They will hammer their swords into plowshares, and their spears into pruning hooks, and nations will no longer go to war. This new Israel will be the Church of the New Testament, because it is Christ who is coming to remake her. The Prophet Isaiah continues the theme of the judgment of Israel in the reading for the first Tuesday of Advent. Because of the sins of the people, God will humble Israel, and the “day of reckoning” – the day of God’s judgment will come, when God will both evil and good. Isaiah chapter 42 begins what are called “the Servant Songs” – about the Servant-Messiah, who will be Jesus, who will show God himself to the world. “Only the LORD will be exalted on that day of judgment” (Is. 2:11), and Christ will shine in glory. Since Christ comes at both His Birth and at the “Second Coming,” and since the Old Testament is a type of the New Testament Church, Isaiah’s prophecy applies to both the birth of Christ and His Second Coming. During Advent, we prepare ourselves for the birth of our Savior, Jesus Christ, and we prepare our souls for the Final Judgment. In this passage for the first Wednesday of Advent, Isaiah discusses the vineyard that the Lord has built—the house of Israel. Those for whom the vineyard was built have not taken care of it. God’s chosen nation was to bear fruit and carry out His work, but the frit was bad, and God tell Israel that he will destroy his vineyard. No other Old Testament writer foretell the life of Christ as well as Isaiah. This passage calls to mind Christ’s parable of the vineyard, in which the vineyard owner sends his only son to oversee the vineyard, and the workers in the vineyard kill him, foreshadowing Christ’s own death. In this reading for the first Thursday of Advent, we see Isaiah prophesying the purification of Old Testament Israel. The Chosen People have squandered their inheritance, and now God is opening the door of salvation to all nations. Israel survives, as the New Testament Church God will establish one of King David’s descendants as king of Israel. God-in-Christ will rule with Mercy and truth and do what is just and right. The Prophet Isaiah continues with his theme of the conversion of nations in the reading for the first Friday of Advent. With the coming of Christ, salvation is no longer confined to Israel. Egypt, whose enslavement of the Israelites represented the darkness of sin, will be converted, as will Assyria. “When the people cry to the LORD for help against those that oppress them, the LORD will send them a savior who will rescue them (Is. 19:19). The Love of God-in-Christ encompasses all nations, and all are welcome in the New Testament Israel, the Church. Isaiah’s prophecy foretells the coming of Christ, and of His triumph over sin. In the reading, Babylon, the symbol of sin and idolatry, has fallen. Babylon was, and remains a symbol of all that stands against God. Despite all its glory and power, Babylon will be destroyed along with its idols. Threshing and winnowing are two steps in the process of farming the wheat. The heads of wheat (used to symbolize Israel) were first trampled to break open the seeds and expose the valued grain inside, called “threshing.” The seed were then thrown into the air, and the worthless chaff blew away while the good grain fell back to the ground, which is called “winnowing.” Israel and the Church will experience the same process: the worthless chaff will be taken away, but God will keep the “good grain” to replenish Israel. Like the watchmen on the city walls, in this Advent, we wait for the morning light and the triumph of the Lord. On the Fourth Sunday of Advent, 23 December 2018, we will decorate the church for the Christmas season. This decoration has been called by several names including “the Greening of the Church,” and “Hanging of the Green.” This is an Anglican and Western European tradition that has been practiced since the Middle Ages. Since the Christmas season was usually cold, gray, and snowy in these places, it was a time people questioned whether the living things made by God, such as the birds, small animals, plants, and trees would survive the long winters. So, in the darkest time of the year, near the Winter Solstice, which is when the Christ-mass was celebrated, Christians copied what their pagan neighbors and friends did, and brought 6 evergreen plants into their homes and churches, to remind them that there is still life in the world. Beginning in the 1400s, this practice of bringing greenery into the sanctuary of churches on the Fourth Sunday of Advent, involved the whole congregation, who worked to gather the greenery and colorful berries, to prepare the church for Christmas Eve services. The greenery was to remind people of the importance of the Christmas season, and not Advent alone, as many congregations do by decorating on the first Sunday of Advent. Evergreens in the sanctuary were symbolic of the eternal coming of Christ to dwell among us as The Word made Flesh. Christians have identified a wealth of symbolism in the different evergreen plants. Holly maintains its bright color during the Christmas season so naturally it came to be associated with the Christian holiday. As such, holly and ivy have been a mainstay of British Advent and Christmas decorations for church and home use since at least the fifteenth and sixteenth centuries, when they were mentioned regularly in churchwardens’ accounts. Among ancient Romans evergreens were an emblem of peace, joy, and victory. Early Christians placed them in their windows to indicate that Christ had entered their home. Holly and ivy, along with pine and fir, are called evergreens because they never change color, even during winter. They were also a sign of life and growth, overcoming and flourishing during the dead of winter, and so the greens represented the Resurrection of Christ. Over time, additional and more specific attributes were given to certain evergreen plants that might be included, as we hear in the carol, The Holly and the Ivy. Holly, especially the variety found in Europe, is often referred to as “Christ’s Thorn.” The sharpness of the leaves help to recall the crown of thorns worn by Jesus. Since medieval times the plant has carried Christian symbolism. The holly represents Jesus, and the ivy represents the Blessed Virgin Mary. They symbolize the unchanging nature of our God and remind us of the everlasting life that is ours through Christ Jesus. In Christian thought and sentiment, holly became widely used in church celebrations. Holly was seen to represent the burning bush from which Moses heard the voice of God, and the shape of the leaves, which resemble flames, can serve to reveal God’s burning love for his people; or a symbol of Mary whose being glows with the Holy Spirit. This latter representation is used in many Advent and Christmas carols. As already noted, throughout the centuries Christians have observed a time of waiting and expectation before celebrating the birth of the Savior at Christmas. The Advent season is a time for reflection and preparation; its mood is more joyful than repentant. During Advent, many churches and people in their homes use the Advent wreath, which usually has evergreen leaves and red berries around it, to reflect its distinctive Christian meaning. These traditions all seek to proclaim the revelation of God’s love as expressed in Christ’s birth in a humble stable, His sacrificial death on the Cross, and His Victorious Resurrection! They point to the hope of Christ’s coming again as the King of Kings and Lord of Lords. In a sense, Advent is asking each of us to make room for the arrival of the Christ Child. Even more than the beautiful greens in our church, the Christmas tree has become the center of many of our festivities. Often glittering with lights and ornaments, it is a part of the beauty and meaning of Christmas. There are several legends and stories about the Christmas tree. The first use of the Christmas tree was thought to be in the medieval German paradise plays, held outdoors and portraying the creation of mankind. The Tree of Life was a fir tree decorated with apples. Later, other ornaments were hung upon them, such as paper flowers and gilded nuts. In England, branches, or whole trees, were forced into bloom indoors for Christmas. From these beginnings the use of a tree at Christmas was established. A story is told that on one Christmas Eve Martin Luther wandered outdoors and was struck with the beauty of the starry sky. Its brilliance and loveliness led him to reflect on the glory of the first Christmas Eve as seen in Bethlehem’s radiant skies. Wishing to share with his family the enchantment he felt, he cut down an evergreen tree from the forest that was glistening with snow and took it home. He placed upon it candles to represent the glorious heavens he had seen. The use of a candle-lighted tree soon spread to all Europe, and it came to be regarded as one of the central ornaments of Christmas. Many churches decorate a live tree with Chrismons—ornaments in the shape of Christian symbols referring to the life of Christ—as well as citrus fruit, berries, cinnamon, and flowers from evergreen bushes. These trees may be in the parish hall or located near the altar in churches with tall ceilings and plenty of room for such decorations in the chancel. The idea of bringing the evergreen into the house represents fertility and new life in the darkness of winter. The introduction of the holly and the ivy and the mistletoe possibly came from this same idea, because they were the few flowering plants in winter and held special significance in the Middle Ages. There is also the legend of the English Benedictine monk, St. Boniface, who was famous for his missionary work in Germany in the eighth century. According to the legend, Boniface encountered some native Germans performing sacrifices in front of a mighty oak tree which was sacred to the god Thor. So Boniface seized his axe and felled the tree to stop the pagans from worshiping an idol. The pagans waited for him to be struck down by lightning, but that did not happen. Boniface then took the opportunity to convert them to Christianity. The legend further relates that out of the center of this mighty oak, a fir tree grew up. Since the fir tree was triangular in shape, it began to represent the Trinity—and the idea emerged that the tree should be a symbol of Christ and new life, and perhaps that is why people began to bring trees into their homes and churches at Christmastide. So, the next time you see the splendor of a Christmas tree, remember that it is a continuing witness to everlasting life as offered to us in Christ Jesus— and it speaks a deeply spiritual message. Advent comes from the Latin word “adventus” which means “to come” or “to arrive.” Advent is considered the beginning of the Christian Church Year for most churches in the Western Tradition, which includes Anglicans. It begins on the fourth Sunday before Christmas Day, which is the Sunday nearest the feast of St. Andrew on November 30th and ends on Christmas Eve (Dec 24th). If Christmas Eve is a Sunday, it is counted as the Fourth Sunday of Advent, with Christmas Eve proper beginning at sundown. The celebration of Christmas (or the feast of the Nativity of Our Lord) is not known before the end of the fourth century, when it was celebrated throughout the whole Church – by some on 25 December, by others on 6 January (the Eastern orthodox churches). There are hints of a period of preparation prior to the celebration of Jesus’ birth – in a ruling in 380 that no one should be allowed to absent themselves from church from the 17th of December until the feast of Epiphany on January 6th – but it is not until the end of the sixth century that a prescribed period of time was set aside as preparation for Christmas. This was from the 11th of November, being the feast day of St. Martin of Tours, (the fast became known as “St. Martin’s Fast,” “St. Martin’s Lent,” or “the forty days of St. Martin”) until Christmas Day. This observance of a period of fasting was later relaxed in Anglican, Lutheran, and later the Roman Catholic Church, although it still kept as a season of penitence by some. The season is for most Christians one of anticipation and hope, although at its beginnings the emphasis was much more on penitence, fasting and sin. For most Christians, it is not just a celebration of a moment in time when a baby was born, but also looks beyond to a time when the Bible tells us that Jesus will come again, not as a weak and vulnerable baby, but in power and with authority. The traditional Scripture readings for this time emphasize both the First and Second Coming of Christ, and our accountability for faithfulness at His coming, judgment on sin and the hope of eternal life. Advent is a spiritual journey that Christians take, through the truths of Scripture that point to the birth of Messiah, to a reaffirmation that he has come, is present in the world today and will come again in glory. It mirrors the journey of faith that Christians make after that moment of realization and acceptance of who Jesus is, in that we take that first step of faith in commitment, continue hopefully to walk the road of faith and increasing understanding, and look forward to our destination, which is to be in His presence forever! Most churches have at the heart of their worship an “Advent Wreath.” Some people also make a wreath for devotions in their home. The Advent wreath was first used as a Christian devotion in the Middle Ages. It gets its design from the customs of pre-Christian Germanic and Scandinavian cultures, who used candles and greenery as symbols of light and life during the dark and cold winter. The candles symbolize the light of God entering the world through the birth of Jesus, and the four outer candles represent a period of waiting, perhaps the four centuries between the prophet Malachi (the last book in the Old Testament) and the birth of Jesus. While the light from the candles reminds us that Jesus is the light of the world that comes into the darkness of our lives, it also reminds us that we are called to be a light to the world as we reflect the Light of God’s Love and Grace to others. There is a symbolism with the wreath and its five candles that is useful in retelling the Christmas story. The circle of greenery reminds us that God is eternal, the Alpha and Omega, without beginning or end. The evergreen symbolizes renewal, and the circular shape the completeness of God, and of the hope we have in God, and eternal life. The Advent Wreath is a circular evergreen wreath with four or five candles, three purple, one rose, and (if you use the five-candle type), one white candle for Christmas Day, placed in the very center of the wreath, if you are using the traditional color scheme. Some Christians use blue candles instead of the traditional purple ones, and others use all white candles. The center candle is white and is called “the Christ Candle.” It is traditionally lit on Christmas Eve after sundown, or on Christmas Day where there is a service on these days. Traditionally, the primary color of Lent is purple, which reflects the Lenten-style fasting that formed part of the build-up to Christmas in earlier centuries. The color purple forms a link between the birth and death of Jesus. On the third Sunday of Advent this changed to pink or rose in anticipation of the end of fasting and the start of rejoicing for the birth of the Savior (the Sunday is sometimes celebrated as Gaudete Sunday – from the Latin word for ‘rejoice’) The candle colors are derived from the traditional liturgical colors of Advent (purple and rose) and Christmas (white). Each candle is first lit on the appropriate Sunday of Advent, and then the candles may be lit each day as a part of the individual or family’s daily prayers. The idea is that God came to earthly life and lived among us. It’s something to celebrate and rejoice, because God was giving the supreme blessing to the created world. But this birth led to an execution of this same God on behalf of us, and then the greatest news that death will not end it all. We need to take stock of why that baby Jesus was here. When we see the baby and the birth, the adult Jesus and His execution are also in sight. And with this comes symbolism used by most churches especially in the coming Christmas season. The Candles symbolize that Jesus is the Light of the World. The first candle shows that Christ our Hope. Christians are lost in sin and Christ is the Light sent into the world to show them the way out of darkness. The candle is a symbol of the hope we have in Christ, and so it is called the Hope candle. The second candle is sometimes called the prophecy candle, because it symbolizes the promises the prophets delivered as messages from God; promises that foretold Christ’s birth. The third, or Joy candle, indicates that the only lasting Joy to be found in life on earth is through Christ. All other joy is fleeting and does not last. It also reminds us of John-the-Baptist who experienced joy that the Jewish Messiah was at hand in his cousin, Jesus. The fourth candle – Love – reminds that Jesus comes to bring Peace to both the world and to people’s hearts. Without Christ there is no peace in this world. Without Christ, the world would not know the meaning of true love – John 3:16. The fifth candle represents Christ himself who is born to save people from their sins. It is a celebration of the fulfillment of Biblical prophecy as represented in Christ’s birth. It is hope in the final fulfillment when Christ comes again, and we Christians may join him at His Heavenly Throne. Though I am writing at the beginning of Advent, I want to take this opportunity to wish you all a very happy and blessed Advent and Christmas. The two Seasons are intimately connected. Without the message of Advent, Christmas hardly makes sense. God prepared for the Incarnation of his Son through patriarchs, prophets, St. John the Baptist, and Our Lady, and then came Christ, not at a random moment, but “in the fullness of time.” The Incarnation was not a panic measure, but part of God’s great strategy from all eternity. So, in perfect trust and hope, let us celebrate Christmas with joy and even merriment. 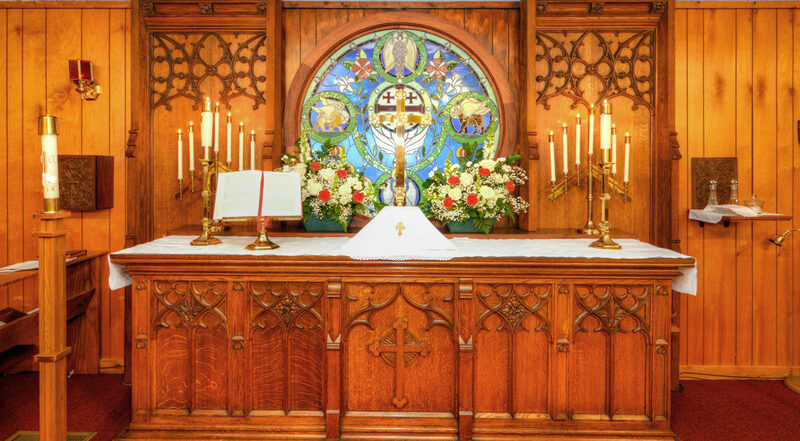 Anglicanism expresses the truths of the Christian Faith, not only in the words of the preacher and those who read God’s inspired Word in the Bible, but also in feasts and processions, in Christmas cribs, in holy water and incense, in glorious altars and beautiful shrines. The Puritan spirit was highly suspicious of all these things, and indeed Cromwell did his best to stamp out Christmas celebrations in England during the Commonwealth. But the human spirit is naturally universal, and the restoration of Saint King Charles II was greeted throughout the kingdom with an upsurge of relief and happiness. So, in this new Church Year let us prepare our hearts and minds for the coming of Christmas, in this spirit of simple, childlike thankfulness for God’s great gift of his Son. Give all your Christmas gifts to those whom you love in the same generous spirit (including your pledge to the church – to enable her to continue the work of salvation.) Kneel in all simplicity before the manager and offer the Christ Child your gift of loving service; kneel in all simplicity in your confession and wipe the slate clean of your sins; and then kneel at the altar rail and receive into your very being the gift of the Body and Blood of Christ, the dynamic life of God himself. Then, when we wish each other a Merry Christmas, it will be no empty phrase, but a heartfelt blessing. May the Christ Child and his blessed Mother watch over you and those whom you love this Christmastide, and forever. As we celebrate the great Easter mystery throughout the Diocese of Mid-America and the Anglican Province of America, I am reminded more forcefully than ever that Easter Sunday only makes sense in the light of Good Friday and Holy Saturday. We will begin to understand the beauty and mystery of the resurrection, only when we see it as part of the greater mystery of the Lord’s life, death, resurrection and ascension to his Father in heaven. Holy Saturday must have been a day of profound suffering and even despair for the disciples of Jesus. They had seen their beloved Master, the one in whom they had placed all their hopes, cruelly tortured and murdered before their eyes. For the repentant thief, however, Holy Saturday was the “first day” of his joy in the fulfilment of Jesus’ promise: And Jesus said unto him, Verily I say unto thee, Today shalt thou be with me in paradise (23:43). That promise was Jesus’ response to the thief’s own prayer: And he said unto Jesus, Lord, remember me when thou comest into thy kingdom (Luke 23:42). It was a response born of Jesus’ merciful heart. There is another prayer in St Luke’s account of the death of Jesus. This time, it comes from Jesus Himself: Then said Jesus, Father, forgive them; for they know not what they do (Luke 23:34). This prayer, too, comes from the merciful heart of Jesus. In the midst of unimaginable suffering, we see Jesus with His mind and heart turned towards those who are seeking to destroy Him. He does so not in anger, or in a search for vengeance, but with merciful compassion and a burning desire that His murderers be forgiven. In our tradition, it is we, all of us, who must number ourselves among those who bring Jesus to His death, and the deadly power of our sins is met with divine mercy. Indeed, it is precisely our sinfulness, our self-centeredness and our cruelty, which draws God’s merciful gaze to us. He looks upon us, not with the eyes of an angry judge, but with those of a loving Father. This was the constant message of Jesus throughout His life. During Jesus’ lifetime, his message began to free his disciples from fear. The experience of Good Friday must have changed all that. Thrown into despair after His death, they must have thought, on that Holy Saturday, that it was “just too good to be true”. It was the unbelievable event of the resurrection on Easter Sunday which convinced them that the extraordinary teaching of Jesus about the compassionate mercy of God was indeed true, beyond their wildest dreams. This is what we celebrate at Easter. The resurrection assures us, in the most emphatic way imaginable, that God truly is as Jesus proclaims Him to be. He is a merciful, compassionate and forgiving God. He invites us, in the words of Jesus, Come unto me, all ye that labour and are heavy laden, and I will give you rest (Matthew 11:28). May this invitation find an echo in your hearts as you celebrate Easter this year. And may the Lord’s Easter gift of peace bring joy to you, your families and all those you love. It is fair to say that the parish and/or mission remains the primary experience of Church for many traditional Anglicans. There is much to celebrate in the DMA, the DOW and wider APA — the commitment of our leaders, ordained and lay, various forms of pastoral activity and outreach, the living faith that makes these parish and mission communities a true spiritual home. However, we are also conscious of the many challenges that face our parishes and missions. Among these is the decline in the number of those attending these parishes and missions on a weekly basis We are witnessing ageing congregations with fewer among younger generations to replace them as we move into the future. Gone are the days when disgruntled members of the Episcopal Church find their way into our pews, even for the occasional visit! Indeed, it could be said that we, as continuing Anglicans, do not often talk about ‘Church growth’ or ‘growing the Church’, apart from the occasional appeal for priestly vocations. And yet . . . God calls our Church and our parishes to grow. While this may seem obvious, many continuing Anglican parishes and missions have not made growth in faith and the gaining of new members the explicit goal of their life and ministries, and dangerously only assumed them to be so. Without the desire to grow and actual plans to bring it about, we end up drawing on the same, small pool of laypersons for parish ministry and service, we struggle with succession in ministries leading to burn out and fatigue of our existing members, we become trapped in a self-affirming traditional Anglican culture that neglects our God-given purpose to evangelise, and even risk becoming parish and mission communities that are content or resigned to grow old rather than move forwards. It is worth noting that the emphasis in traditional Anglican parish communities has traditionally fallen on the catechesis of children and youth. It is understandable that we want young people in our parishes and missions for their vibrancy and energy as well as the tangible hope that they bring. We all know that an over abundance of youth has never really been present from the beginning of our movement. However, we need to acknowledge that young people will not be attracted to parishes or missions that show no energy or dynamism in themselves. If we want to raise the standard of discipleship in the Church then adults who are prayerful, steeped in Scripture and Tradition, and theologically literate must be the new norm. When we consider our parishes and missions, the sources of formation for the majority of those who attend can be limited to essentially the parish bulletin, a homily preached well or otherwise, and perhaps the sign value of the sacraments. We are, if we are honest with ourselves, often relying on the fact that new and established members of our Church are simply ‘putting it all together’ by themselves, an optimism that that is not supported by the reality of parish decline. From observation, people are grasping only fragments and from the outside. One certainty is that parishes do not grow if the clergy and leaders of the parishes do not want them to. We cannot assume parish clergy and leaders want to grow their community when there are no specific plans or intentions to do so. It is interesting to note that emotions in a parishes or missions can pour out over changes to buildings, Holy Communion times or parish structure but rarely do they pour out over the absence of newcomers from our pews. Perhaps our hearts can be set on stability rather than growth. To make this concrete, we might ask ‘what is the vision of your parish for its life over the next three years?’ Traditional Anglican parishes and missions do not often articulate such a vision and yet are surprised that the commitment level is so low. Commitment will always be low when there is no direction, no sense of purpose and aspiration for the community. Note also that a vision cannot simply be put on a noticeboard; a vision has to be explained, shared and talked about time and again, explaining ‘where we are going’ on the basis of where we are. When a parish or mission has a clear plan, including a vision for where it wants to be in time and actions, and owners of those actions and timeframe to bring them about, it also becomes possible for parishes and missions to let go of activities that do not help them to achieve their goals. Planning reminds a parish that its mission is not to preserve ashes but to keep a fire alive. At the Epiphany, we read of the Magi travelling from the East, not for a vacation but because they believed that God was calling them to set out from their own country to find the Christ Child, the new King of the Jews. Long before the Wise Men, God called Abraham to leave his home and kin and set out into another country, and many years later Moses was called to lead the children of Israel from slavery in Egypt into the wilderness and then over the Jordan. The common factor in these episodes was that they were asked to travel through far-away places to do God’s will. All of us are on similar pilgrimages. We are pilgrims for Christ’s sake, willing to go where He calls and to do what He asks. Of course, it is not necessary for all of us to travel great distances: we can be pilgrims in the spirit, travelling great mental distances from selfishness to generosity, from cruelty to kindness, from hatred to love. The important thing for a pilgrim is always to be on the move. A little bit of our journey should be achieved every day, along with the necessary rests and meals to keep us going. And that is what the Church’s vocation is — to provide the viaticum, the food for the Way. The Church is God’s Inn where, unlike the inn at Bethlehem, all are welcomed to come in and rest. Then food is provided, the Word of God in the Holy Scriptures, and the Body and Blood of Christ in the Mass. The Church offers friendship and companionship on the pilgrimage so that no one need ever feel they must go it alone. Stories are told about great pilgrims of the past and of the Saints who encourage us, and help us to face up to the dangers that lie ahead, and the sufferings that must be borne if we are to finish the journey. But above all, in the Church, all of us who are pilgrims have a picture painted for us of the place to which our journey points, and to the all-loving Father who is preparing to welcome us into our real home to start our real life in eternity. To some, this sounds too good to be true, but millions have lived joyfully as pilgrims and died in a sure and certain hope of the Resurrection. Remember, the Resurrection seemed too good to be true to the first disciples, and yet they soon found they could live a new life, moving forward every day in the presence of Jesus. They were sustained through all their troubles by prayer, sacrament and charity—just as we can be here in our Parish! As one of your Priests, I join a long line of priests who have ministered as Innkeepers for the pilgrims of this world, and walked with them in their joys and in their sorrows, helping one another forward on the road to heaven. There, like the Magi, we shall find that it wasn’t very complicated after all. Our Lord will welcome us with the simplicity of a child, and his blessed Mother will share our joy at having made it at last. St. Chad’s is comprised of a rich and diverse group of committed Christian believers, literally from all over the globe. We are an Anglican parish that willingly serves the Lord, that looks out for each other lovingly and dutifully, and that embraces the opportunity to show and share our faith with any and all. We are St. Chad’s Anglican Church, and we invite you to join us!